The Greek land has been formed within million years of geological evolution. The German professor Alfred Phillipson who studied the northeast part of Europe, in the late 19th and early 20th century, named Aegeis the region ranging from the mountain ranges in the west coast of Greece to the east to Asia Minor and from the coasts of Thrace and Macedonia down to the south Peloponnese and Crete. Aegeis changed many times either whole or in part. Periodically was becoming bottom of the sea or, as it was lifting, formed land while mountains were created, which gradually weathered and their materials were filling cavities, forming the substrate to new mountains. During the oldest geological century, the Archaic, the first mountains formations on Earth were only in the area that is now Canada. Europe was not affected, therefore Aegeis which was covered by waters, formed the bottom of the sea. New mountain formations occurred in the Paleozoic century, mountains uplifted in the northwest Europe, which in our days are low hills. Experts consider that it was then, in Aegeis, when some tops above the sea surface appeared. Mountains were formed again in later periods of the Paleozoic century in various regions of the Earth. In Europe mountains uplifted in the central plateau of France, the Ardennes, the Vosges, the Urals and others. At that time in which there was also great volcanic activity, Aegeis was most influenced, as the sea floor started lifting and created a larger land. Before 200 million years at the end of the Paleozoic century and in the early Mesozoic, large movements of the Earth's crust began throughout Europe. In other places upward, and in others downward. Aegeis went downward and the whole area became a sea again. The surrounding sea area was called Sea of Tethys. In all the periods of the Mesozoic century - Triassic , Jurassic and Cretaceous - great geological upheavals took place. 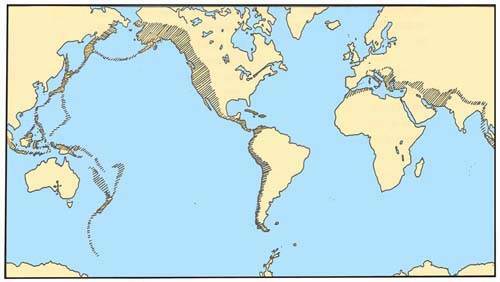 The creation of the Greek land, is considered to begin at the first Triassic period. In the west side of the Greek peninsula a new moat opened, the Moat of Pindos, which gradually filled up with silicates, which later in the Cenozoic century uplifted and formed land. During the second period of the Mesozoic century, the Jurassic, the area west of the moat of Pindos uplifted. This way a new moat was formed more to the west , the Ionian Moat. The third period of the Mesozoic century, the Cretaceous, the bottom of the two trenches sank under the weight of the gathered materials, while the eastern region was lifted, forming land. 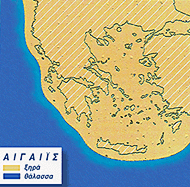 In the first period of the Cenozoic century , the Eocene, this was the only surface in Aegeis, together with small sections further south, in Central Greece and Pylos in the Peloponnese. The next period of Cenozoic century, the Oligocene, Earth experienced the highest tectonic events ever. The Alpine formation. It was then when in Europe, the Alps ,the Pyrenees , the Apennines , the Dinars Alps the Carpathian , Aimos and the Greek mountain range were created. In North Africa , the Atlas and Rif. In Asia, Taurus, Antitaurus, Caucasus, the Himalayas and mountains of Southeast Asia. And in America the mountain range from Alaska in the north down to the cape Horn in the south. It was a new era for Aegeis. The Greek mountain range which is the continuation, to the south of the Dinars Alps, developed to west Greece and continued to Peloponnese and Crete. Then turned eastward, passed the Dodecanese Islands and ended to mountain Taurus in Asia Minor. 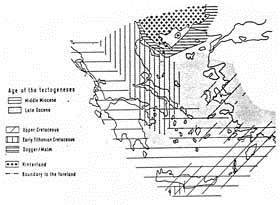 The geological evolution of Aegeis was completed in the next century, the Quaternary. During its two periods, the Pleistocene and Holocene, the Aegean area submerged, Greece was separated from Asia Minor and the land took its final form. With the tectonic movements that turned the land into pieces, many cracks were created. The result was a great volcanic activity. This remote age still carries its mark. The volcano of Santorini and other volcanos in the Aegean Islands.